Herbs are natural. Often they are organic. And there are important herbal treatments for acne. Not every herb, however, helps acne. Some actually make acne. And not every herb helps everyone who has the same acne symptoms. Tea tree oil can help fight bacteria and reduce inflammation. Here is what you need to know about acne herbs that work, and acne herbs that don’t, organized from A to Z. Not every herb helps acne. Bergamot, lavender, lemon oil, linalool, and herbs in the mint family leave the skin feeling tingly. This is not a sign they have disinfected the skin. It is a sign they have irritated the skin, and the skin will have to repair itself by making more oil. Green tea lotions, however, reduce the skin’s oil production and clear up blemishes better than most medications. The Indian herb turmeric (source of the antioxidant curcumin) is a great treatment for the skin, although it will tend to leave an orange tint on the skin. If you use turmeric on your skin, buy gels rather than oils or creams. Oils and creams can clog pores. Neem is great for “getting the red out” of pimples and for stopping skin inflammation. You can use neem oil or neem soap. Tea tree oil fights bacteria and reduces inflammation. It should not be used for treating acne in children or pregnant women. Calendula is safe for pre-teens and mothers to be. It soothes inflamed skin and kills the bacteria that cause acne and staph infections. Bergamot is the form of citrus used to flavor Earl Grey tea. Essential oil of bergamot gives you the get up and go you need to start your day. Unfortunately, that is not what your skin needs when you have inflamed pimples, pastules, or cysts. Drinking Earl Grey tea is OK, but don’t put bergamot on your skin. Calendula is the herbalist’s term for chrysanthemum blossoms. Calendula is both anti-inflammatory and antibacterial, neutralizing both acne and staph bacteria. The best way to use calendula is in face washes designed to calm the skin. In the United States and Japan, the bestselling calendula washes are made by the Tsumura Company. In the rest of the world, the easiest brand to find is usually Weleda or California Baby. These washes are especially useful for treating “pimples” caused by staph bacteria, usually with prominent circles of dried yellow pus in the center of the bump. Green tea is considered a natural cure all, and it very nearly is. Scientists at the University of Miami tested a 2% green tea lotion that reduced the total number of whiteheads, blackheads, and pimples on treated skin by 58%. That is a better result than is usually obtained after treatment with topical tretinoin or oral antibiotics. Scientists at the Islamic University at Balawalpur in Pakistan found that a 3% green tea lotion reduced sebum production in the skin of male volunteers. The people who will get the best results from a green tea lotion are those who have oily or sensitive skin. Green tea on very dry skin may not be ideal, since very dry skin tends to be tight and reducing oil production makes it even tighter. If you have oily, Asian skin, however, green tea lotions may be an ideal treatment. The easiest brands to find are Naked Bee and Proactiv Solution Green Tea Moisture. Green tea capsules are not an ideal way to help the skin, and neither is drinking green tea. Green tea needs to be applied directly to the skin to relieve inflammation and reduce sebum production. Lavender soothes burning sensations in the skin—by creating counterirritation. If you have acne, your skin may feel better even though irritation is worse. The net result of putting lavender on your skin is greater inflammation and more breakouts. Lemon oil smells great. Unfortunately, it also irritates the skin, and skin repairs itself by making even more sebum. Stay away from lemon oil in any and all skin care products if you have acne. A plant chemical found in citrus, linalool is the chemical that imparts a distinctive flavor to basil, grape juice, clover, orange peel, mint, oregano, peppermint, red wine, spearmint, tea tree oil, thyme, and tempura batter. It’s great for helping you relax after physical stress, but it causes inflammation when it’s put on your skin. Just say no to acne skin care products that contain linalool. Plant oil essences made from herbs in the mint family smell good. They leave your skin feeling tingly. And they make breakouts worse rather than better. Most mint oils dry out the skin. The skin repairs itself by making more sebum, and the additional sebum clogs pores. Plants in this family smell good, but a few days after you use them your skin breaks out even worse than before. Ayurvedic medicine often combines neem with turmeric in treating acne. Neem does not have a direct effect on acne bacteria, but it reduces inflammation in the skin and thereby relieves redness and makes pimples less prominent on the skin. You can apply neem oil directly to pimples, or wash your skin with neem soap. Always test a dot of any neem or any other new herbal product on your skin to make sure you are not allergic to it. Tea tree oil (not to be confused with green tea) is the world’s bestselling herb for acne treatment. 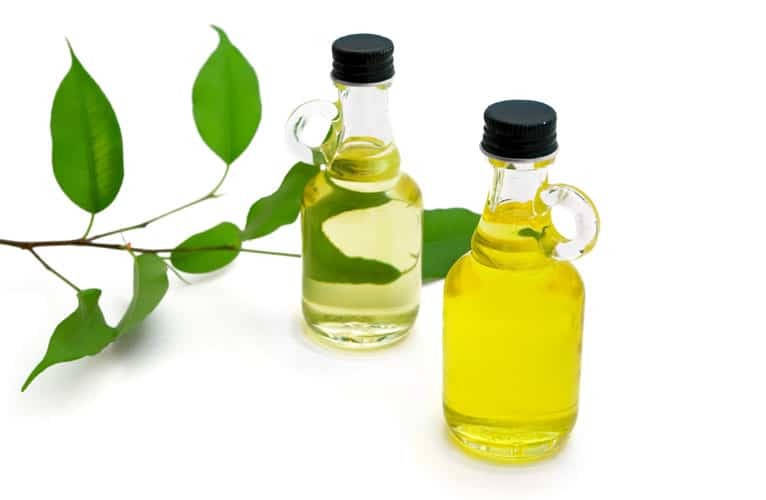 The problem with most acne treatments that contain this Australian herb is that they contain enough tea tree oil to smell good but not enough tea tree oil to fight acne bacteria. For tea tree oil to fight acne infection, it has to be at least 10% strength. The only way to know for sure that you are getting this much tea tree oil is to apply pure tea tree oil directly to red and inflamed blemishes with a clean cotton ball. Tea tree oil takes about 72 hours to bring acne infection under control. Unlike benzoyl peroxide, it also relieves redness and fights staph infection. It’s not recommended for treating acne in children under the age of 12, and it is not proven safe for use by pregnant women or nursing mothers. The orange-yellow curry spice turmeric is the natural source of the antioxidant curcumin, thought to be almost a cure-all for many ills. Ayurvedic medicine has used turmeric as a treatment for acne for thousands of years, usually in pomades that are applied directly to blemished skin. The use of turmeric in treating acne has been confirmed by clinical studies in India that have found it to be as effective in clearing up acne as the antibiotic clindamycin, which is the most frequently prescribed medication for acne in India. It is OK to use turmeric to treat inflammatory acne. That is, it is good for pimples, not for whiteheads and blackheads. It is best to use a gel rather than a oil-based lotion on blemished skin. Witch hazel is an astringent herb. Most of the time you don’t want to put astringents on acne-prone skin, since acne-prone skin needs to drain and astringents prevent the leakage of fluids through the skin. In an exfoliant product, however, witch hazel prevents loose flakes of skin from finding their way into pores, and helps the exfoliant (such as glycolic acid) leave a more even finish to the skin. Buying herbal acne treatments separately gets to be expensive, and herbs are never all you need to fighting acne. The best way to fight acne without spending too much time and money is to buy an acne treatment system such as Exposed Skin Care. Chrysanthemum and calendula are completely different plants. Chrysanthemums are ornamental plants and some are used to make insecticides. The flower you're thinking of is Marigold, which is a common name for Calendula. Calendula has a long history of use as a remedy for wounds and other skin problems.